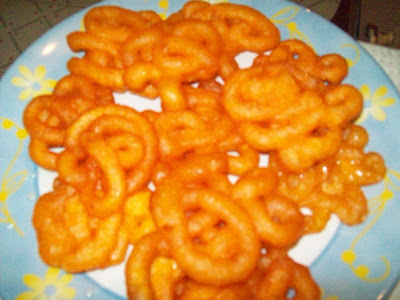 Jangri –A famous Indian sweet which look a like jelabi but they have different flavor and texture.Jangiri is made from urad dhal and jelabi is made from Maida flour. 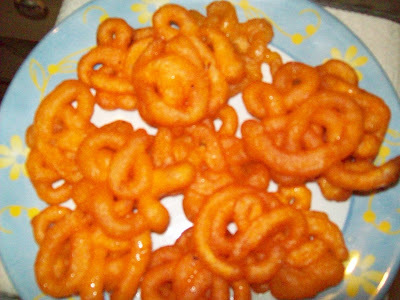 This crisp sweet is very famous in the southern states of India. To make Jangri you will need to make a rett. You can make this at home. Take a thick cloth and double fold it. Then as in the diagram cut a hole in the centre and run firm stitches around the hole in concentric circles. The stitches near the centre hole should be placed closely. The central hole should be small enough to just let out a continuous flow of the dough. My mom used to make using separate cloth stitched by our tailor. I made do with a conical disposable plastic icing bag with the tip cut off, and poured the batter into it. Not the best idea, really - it kind of worked, but a good portion of the batter was wasted. My jangrys turned out a bit wonky in shape. Then again, I'm not a proficient sweet-maker. so they would have been shapeless no matter what I used. Wash and soak the dal and rice in water . Mix kesari powder with the batter. Prepare syrup using 1 Cup of water to 3 cups of sugar until a one string consistency of the syrup is attained. This consistency of the syrup can be tested by holding a drop of the syrup on your thumb and trying to draw it up as a single thread with the help of the pointing finger. Add a bit of Rose water and kesari powder and dissolve. Grind the dal preferably in a stone grinder or wet grinder as the use of a mixy would heat up the dough. Drain out the water used for soaking and grind the dal without adding water. The dough must be tough in consistency. Add a bit of kesari powder to the dough and mix well until the dough is pale yellow in colour. Place oil/ghee in a shallow pan and heat well on high flame. Once it is hot simmer the flame. Place a ball of the dough on the rett in the centre near the opening and fold the four corners to make a bundle of it. Hold this a little above the oil/Ghee and squeeze out the dough in a circular fashion. Make small overlapping coils in the circumference of the circle by moving anticlockwise.Then end by making a circle in the centre above the first cirlce. 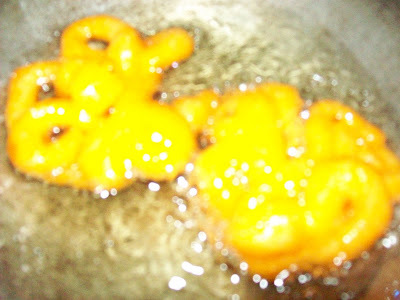 You may try to practise desingning your Jangri in circles before doing in the oil. Once the Jangri is well fried crisp and golden in colour remove from oil and drop into the syrup. As soon as the fried jangri is put into the syrup it immediately absorbs the syrup. the syrup. As soon as the fried jangri is put into the syrup it immediately absorbs the syrup. I am sending this recipe to ''FESTIVE FOOD: DIWALI CELEBRATION'' HOSTED BY PRITI. Good to see that we can make our own jangri. Nice tips to use the icing cones to make jangri.The jangri looks tempting.Happy Deepavali. Its my favorite too!looks very nice! Very nice recipes. Nice tips to follow to make a recipe. Your way of presentation is awesome. Thanks for the detail recipe of Sweet Jangri,I knew only about Jelabis. They are Cute ur jangri :) My belated Diwali wishes! Jangri looks so tempting and perfect I am drooling here! So happy for you ! Your are is so pretty! !